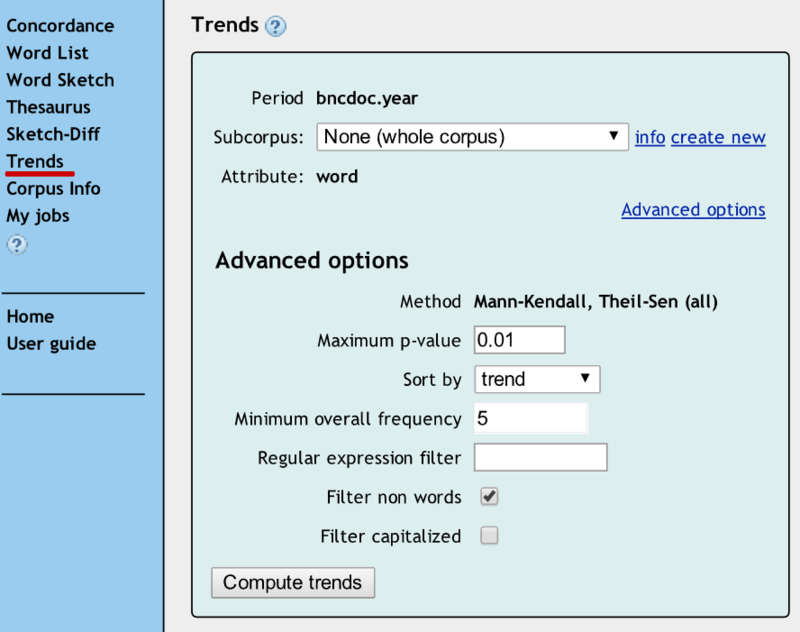 Trends is a feature for detecting words in a corpus which undergo changes in the frequency of use in time (diachronic analysis). Trends identify and order words based on their growing use (new words or neologisms) or decreasing use in the given period of time. 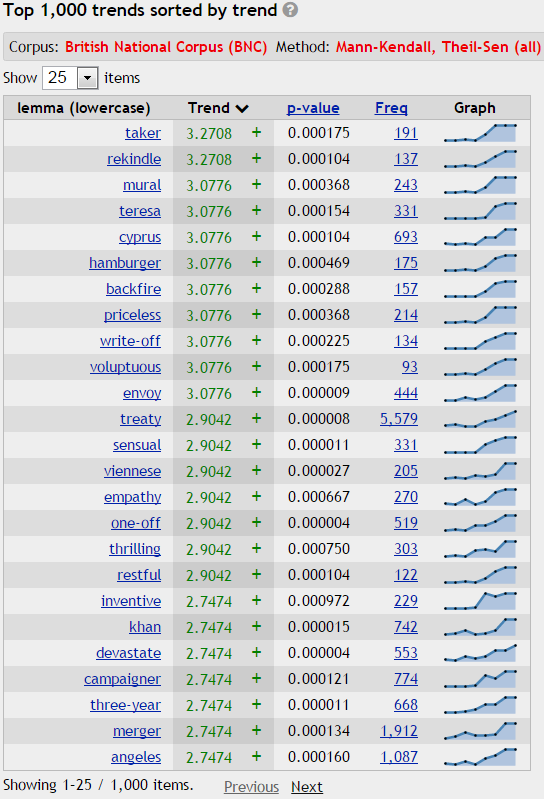 Lexicologists can use trends to identify new words (neologisms) and historians can use trends to identify the point time when a word started to be used, stopped being used or when it saw an unusually increased use. For a detailed description of the algorithms and comparison of their performance, see Ondřej Herman’s bachelor thesis. Which corpora can be used? The second principle is the balance of data. If most of your texts belong to only a few periods from a wide range of periods, the results will be biased by the periods with most texts. Data have to be annotated with time stamps. The name of the timestamp attribute is user-defined (e.g. pub). The same corpus can contain several timestamp attributes. It is not necessary to have the timestamp in each document, but trends will be computed only from documents with the time stamps. The analysis will then be performed on each of the attributes independently. A number of attribute values should not exceed 500. The values must be composed of the same number of characters, the longest time period must come first, the shortest last. Non-numerical characters are allowed but will be ignored when the values are interpreted. All values within the same corpus must have the same format. If you have problems with setting things up, please ask for assistance. If the diachronic analysis is available for a corpus, the left menu will contain the Trends link. This will take you to the Trends form. You do not have to change any settings and click Compute trends. By default, the results are sorted by the absolute value of the change. This means that the words with the biggest change will be at the top irrespective of whether the change was positive (=growing usage) or negative (=decreasing usage). 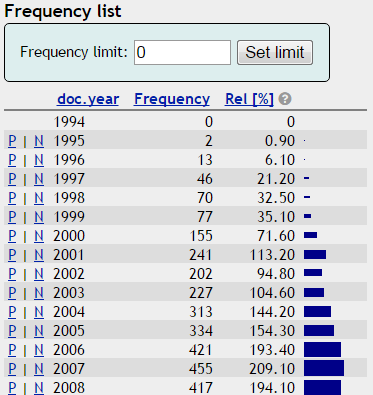 Frequency list broken down by the year, the time interval available depends on how the corpus is annotated, corpora can be annotated for smaller or bigger units such as months or decades. A script “mktrends” is part of Sketch Engine. If you have a local installation, you can call the script directly in your command-line. Without parameters, it gives this information.